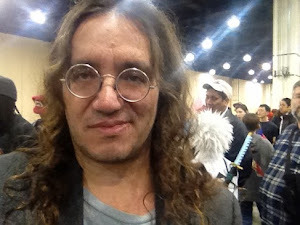 In which Dr. Goertzel briefly outlines a new way of thinking about the Global Brain , in terms of the concept of "glocal memory" ... leading up to, at the end, a new suggestion about what the first super-powerful AGI on our planet may look like (to wit: AN INCREMENTAL MIND-UPLOAD OF THE GLOBAL BRAIN)..
After a few glasses of excellent wine, I started thinking about all the trends and patterns that had come together to bring us to that restaurant to discuss that project. All the trends that had converged to make Guangdong Province the world center of consumer electronics manufacturing. The factors underlying the current relatively easy availability of mainland Chinese funding for interesting tech projects. The factors that had brought me to Hong Kong -- Hugo de Garis's position at Xiamen University, Gino Yu's assistance getting funding for OpenCog work at Hong Kong Poly U, the convergence of international bankers in Hong Kong enabling funding of Aidyia Holdings, our AI based hedge fund, etc. etc. I fell in love with a girl named Ruiting Lian in Xiamen in 2009, and now being married to her is helping my understanding of the Chinese system in general -- helping me collaborate with Chinese programmers, and do business with Chinese firms. I met her because Hugo de Garis invited me to Xiamen, where he was because the Chinese university system was more open to his wacky ideas than the US university system. Even the most intimate and personal parts of our lives are driven along by these broader trends, and then help push these broader trends along. Can we say that the humanoid robot design we were cooking up over dinner that night, is a thought produced by the global brain? In what sense? a neurally global form (as a pattern of activity across a large number of neurons occupying a significantfraction of the brain). This general notion has been around a while (without use of the word "glocal") -- e.g. William Calvin's work from way back when. "Glocal memory" overcomes the dichotomy between localized memory (in which each memory item is stored in a single location within an overall memory structure) and distributed memory (in which a memory item is stored as an aspect of a multi-component memory system, in such a way that the same set of multiple components stores a large number of memories). 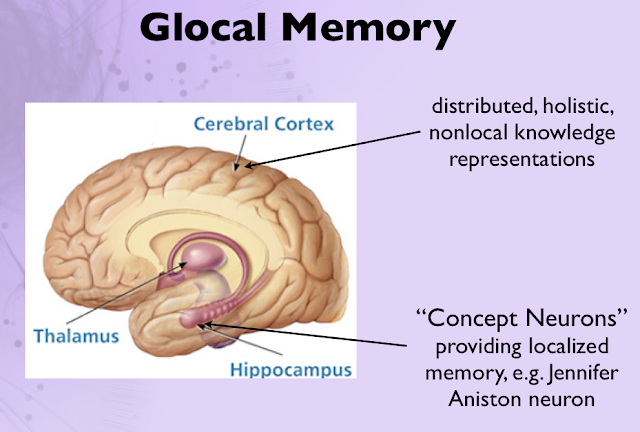 In a glocal memory system, most memory items are stored both locally and globally, with the property that eliciting either one of the two records of an item tends to also elicit the other one. In a 2013 paper, I gave a moderately detailed, fairly speculative model of glocal memory in the human brain. The classic example of localized memory in the brain is the Jennifer Aniston neuron. Many neuroscientists' brains were blown by the discovery of individual neurons in the hippocampus that fire specifically when the face (or voice, or name) of the actress Jennifer Aniston is perceived. We must remember, though, that these localized memories in the hippocampus are not the ONLY kind of memories in the brain. The cortex contains memories as well, that appear to be stored in a very different way, involving diffuse activation patterns distributed across large numbers of neurons. "Glocal memory" in the human brain, then, appears to involve dynamic interaction between localized "concept neurons" in hippocampus, and more distributed memory attractors in cortext. The presence of these concept neurons gives an interesting potential direction for brain-computer interfacing research. Why not connect nodes in a neural-semantic network -- like the one inside OpenCog -- to a brain's concept neurons? Connect the "Jennifer Aniston" node in an OpenCog Atom-network, to the "Jennifer Aniston" neurons in a person's brain? Actually, OpenCog's internal representations are glocal as well -- OpenCog has a distributed-attractor modality for representing "Jennifer Aniston", as well as a localized-node modality. But connecting localized representations to one another would seem the easiest way to connect OpenCog to a human brain, enabling human-AGI co-cognition. The general idea of the Global Brain is that computing and communication technologies may lead to the creation of a kind of"distributed mind” in which humans and AI minds both participate, but that collectively forms a higher level of intelligence and awareness, going beyond the individual intelligences of the people or AI’s involved in it. Of course point 4, is what makes it "global", and that criterion is arguably dispensable.... A Global Brain that leaves out North Korea can still be considered a decent Global Brain. A Global Brain that leaves out, say, China -- or that is only operational in China -- would have basically the same structures and dynamics and properties as one that spanned the whole world. To what extent a Global Brain currently exists, or will soon come to exist, is a tricky question on which different experts will give different answers. Concrete measurement of the degree to which a Global Brain is present is not something we really know how to do right now. Francis Heylighen and his colleagues at the Global Brain Institute in Brussels are working on it! I guess you can see where I'm going now. The glocal brain has already put the idea into your unconscious mind, right? Perhaps we should view the Global Brain as possessing glocal knowledge representation -- both localized and distributed representations of the same piece of knowledge, acting in a coordinated way. Localized representations have advantages for symbolic thinking -- they are easier to manipulate and combine in certain ways. Global distributed representations have advantages for creative thinking -- they are easily morphable and content-addressable, and have analogy and metaphor built right into them. The human brain/mind makes use of both, why shouldn't the global brain? But what are the localized representations in the Global Brain's mind? What are the Global Brain's "concept neurons"? The Global Brain's "concept neurons" are precisely: The ideas that are explicitly formulated in our own conscious minds, and written down in our books and papers and emails and so forth. And the Global Brain's distributed cortex-type memories, are the subtle trends and broad patterns that guide us throughout our lives in barely-perceptible ways. The Global Brain differs from a human brain/mind in many ways -- it lacks an extremely pushy, particular goal system, like we humans get from our hindbrains. In the terminology of Weaver and Viktoras from the Global Brain Institute, it is more strongly an open-ended intelligence -- a self-organizing complex system ongoingly creating new patterns and exploring and overcoming its own boundaries, rather than a system oriented toward optimizing achievement of certain specific goals. But the glocality of the Global Brain's memory is one aspect in which it resembles human brains. In the end human brain/minds are open-ended too -- but we can at least roughly approximate human brain/mind dynamics by thinking about optimization toward achievement of specific goals. For the Global Brain, this kind of analysis isn't even an OK approximation, it's jut wrong. An open-ended intelligence type model is utterly necessary from the beginning. What was happening in that dinner in Tsim Sha Tsui, then, was -- the Global Brain was trying to enshrine some patterns from its distributed, global memory store, in its localized memory store. It was trying to pack some broad, diffuse, distributed patterns into "concept neurons" -- i.e. into the brains and writings and software and hardware creations of the humans sitting around the table, and all their employees and colleagues. If the Global Brain succeeds in doing this, it will then guide the creation of new and ever more amazing humanoid robots -- which will then guide the creation of yet more subtle, subterranean patterns driving peoples' actions in an unconscious yet exquisitely coordinated way. This is the feedback between global and local memory, the essence of glocal memory. AGI systems capable of aggressively recognizing patterns in the activity of humans and AGIs and narrow AIs and other software and hardware on the planet, may be able to serve as higher-capacity concept-neuron networks than people are -- and may massively accelerate the ongoing, iterated process of concretizing global memory patterns into localized patterns. And this leads on to one more idea I'd like to throw at you before I leave the computer for the evening, and go crawl into bed to watch a movie with Ruiting.... Maybe the first AGI will not be a mind-upload of any human, nor a purely engineered intelligent mind -- maybe the first AGI will be a mind-upload of the Global Brain. Indeed, once this is said it seems almost trivial and obvious. Of course it will be. The Global Brain is far more intelligent than any individual human. And AGIs are not going to be developed in a box in somebody's basement, or in some top-secret military or corporate lab -- they're going to be out there on the Internet, enhancing everyone's searches and analytics and so forth ... making the Global Brain smarter and smarter. As AGIs gradually make the Global Brain smarter and smarter, they will also gradually make the Global Brain more and more AGI-centric, with human participants playing less and less of a critical role as the AGIs get smarter. 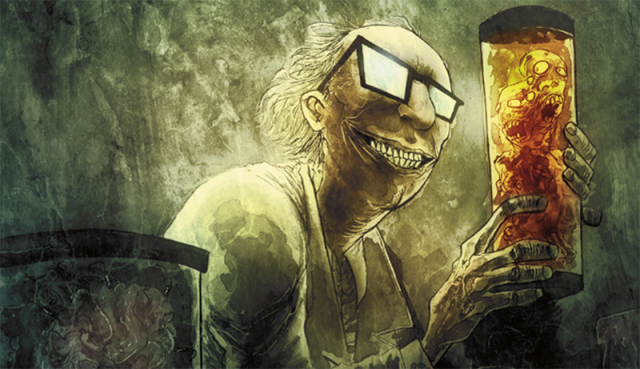 Before long, then, the Global Brain will morph into its own mind-upload. 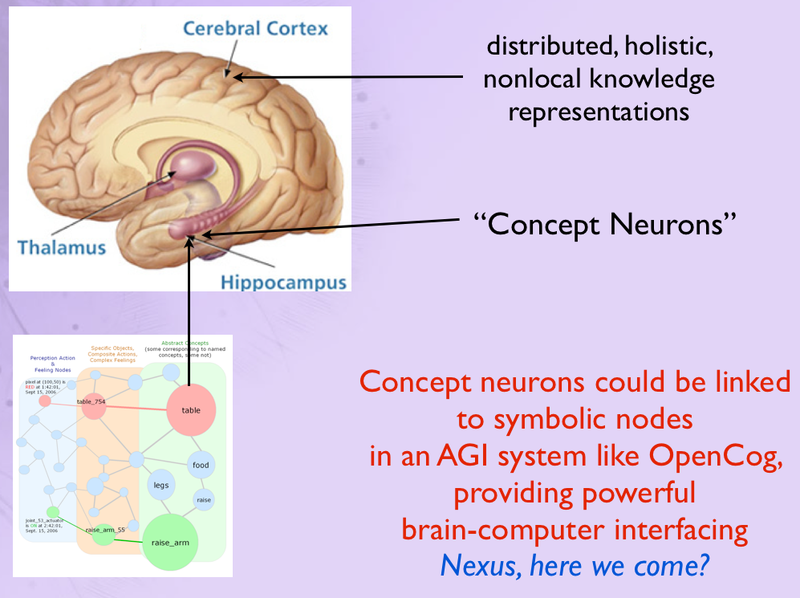 Via gradual replacement of the human "concept neurons" with AGI "concept neurons." What this incrementally-uploaded Global Brain will then morph into, as it ongoingly learns and self-improves -- and encounters aspects of reality the human-based Global Brain never imagined -- is another question. We can't know and our current Global Brain can't know, any more than cockroaches or cavemen could predict the course of the Internet. Is a Human Borg-Mind Inevitable? There's a well-known rule that if an article has a headline in the form of a question, the answer is NO. A "borg" mind, as popularized by the classic Star Trek episode, is a group of people all controlled by a single collective will, consciousness and memory. It's obviously an extreme invented for entertainment purposes. A more common term is "hive mind", but there are many kinds of hive minds, of which the Borg Collective in Star Trek is a particular variety. What I do think is very likely is that individual humans get sidelined via the emergence of some sort of mindplex ... a term I introduced over a decade ago to indicate a network of minds that has its own emergent consciousness, will, memory and individuality -- yet also allows the individual minds in the network to have these aspects on their own. "Mindplex" is a very broad concept and encompasses options that are more "society of individuals"-like alongside some that are more borg-like. Why do I think the dominance of mindplexes over 2015-style human individuals is very likely? In short, because of: Brain-computer interfacing (BCI), the inefficiency of current means of communication, and the human love of togetherness and socializing. Reading Why Information Grows by Cesar Hidalgo, I was pleased with his summary of ideas regarding why companies tend to become less efficient when they expand beyond a certain size. Basically, following prior research of others, he attributes this to the cost of building links (links between people or companies in this case). In the business world, building links between individuals in different companies is costly, because it requires lots of negotiation, legal overhead, etc. Linking between different individuals in the same company is generally cheaper. Yet, when a company becomes too big, this is no longer necessarily the case. In a big company, it's often easier for a department to outsource work to an external contractor, than to deal with another department of the same company. This may occur because of complex internal politics, or simply due to the bureaucracy that seems to inevitably spring up when a company grows beyond a certain size. When the cost of building the internal links needed to get something done exceed the cost of getting the same thing done using external links, then a company may stop growing in size and begin to grow in capability via networking with external entities instead. Further, one thing we see happening in the tech biz world now is: the cost of linking between different companies, or companies and external individual contractors gets cheaper. This is the move toward a "gig economy", as it's been called. Cheaper links between organizations will tend to lead to smaller, leaner organizations. One thing that I kept wondering while reading Hidalgo's book, though, is why our society is dominated by organizations that are glued together by ECONOMIC transactions. I mean, economic interactions are important, but they are not the only kinds of links between people. There are also emotional and relational links, intellectual links, spiritual links, and so on. Yet it's organizations based on economic links that are currently dominant. What could change the landscape fundamentally, then, would be if other kinds of links became much easier to form. Forming links based on, say, friendship or sexual relationship or intellectual interchange or shared goals is currently much more difficult and time-consuming than forming links based on monetary exchange. So groups founded on other sorts of exchange are going to be smaller and less able to grow rapidly than groups founded based on economic exchange. Given the current state of things. I experience this phenomenon quite concretely in my AGI work. It's possible to pull together great contributors for a science or engineering project without paying anyone -- just by recruiting people with a common goal and vision and building a shared feeling and community among them. But in many ways this is MUCH MUCH HARDER than simply hiring and paying people. Of course, a great community of unpaid contributors can have a self-organizing, self-motivated aspect that MOST groups of employee collaborators won't have. But it's also possible to get great collaboration and enthusiasm among a paid team -- if you hire the right people who gel with each other.... Once a non-monetary link with a project contributor is made, it can have great persistence (or it can evaporate when the person's life situation changes and they suddenly need to spend more time earning an income). But forming non-monetary links just tends to be a lot slower, whereas hiring a contractor is almost instantaneous these days, with sites like Upwork and Elance. But what if we had, for instance, brain-computer interfacing technology? What if we had BCI hooked up to allow different people to directly interface with each others brains? And networks of people that cohere together based on deeper forms of exchange -- intellectual, emotional and spiritual -- are likely to be much more effective than networks cohering based on economic exchange. Encoding information about needs, desires and motivations in economic terms is terribly inefficient, really. Paying an employee to align their goals with one's own, is of meaningful yet erratic effectiveness. Spelling out one's needs and desires to a subcontractor in a requirements specification coupled with a legal contract, is always a terrible oversimplification of one's actual needs. How much better to have a collaborator who really gets one's goals at the deep level, or a subcontracting organization that understands one's requirements at a deep and intuitive level. And these things happen sometimes. But what if they could happen systematically? For this reason I think BCI will be the death of corporations -- they will simply pale in effectiveness compared to networks of people that self-organize based on deeper kinds of exchange than the economic. But the implications are much broader than this. BCI may also lead -- perhaps quite rapidly -- to the obsolescence of individuals as we know them. Most of the use we get out of Internet and computing tech these days, is oriented toward communication. With Facebook, SMS, video-chat and all the rest, we ensconce ourselves in interaction with others as richly and constantly as we can. 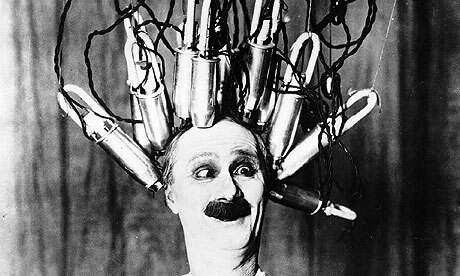 If BCI were rolled out, it would immediately be applied to various forms of brain-to-brain social networking. Sufficient use of this kind of technology will cause brains to adapt physiologically to BCI-powered neurosocial networking. So -- Will this make us a borg? Not exactly. But it will make us part of something new, a new kind of mindplex, something between present-day notions of individual and society. A true undifferentiated borg mind is unlikely to be optimal as a problem-solving system, for the same reasons that island models work in genetic algorithms (and why OpenCog's evolutionary program learning component, MOSES, works by evolving distinct "demes" of programs). Given realistic resource constraints, one often gets more innovation by letting different pools of resources evolve somewhat independently. The overall system can then choose the best (by its own explicit or implicit criteria) of what the various somewhat silo'd off subsystems have created or discovered. So one fairly likely-looking possibility is that, after the emergence of powerful BCI: Instead of individuals looking out for their own personal good, and banding together into organizations based crudely on economic exchange -- we will have networks of tightly bound group-minds, interacting based on directly exchanging goals, values and ideas ... and periodically re-shuffling or merging within a broader network of mindplex-like emergent intelligent patterns. One big question , though, is how this will interrelate with advances in AGI. The same tech that will let us network our minds together, will let us execute Google search queries and access calculators and general software programs from within our minds. The same tech will also let us share thoughts with any AGI software that exists at a given point in time. For sake of having an interesting discussion, let's assume a positive post-Singularity world where humans have options and choices (see my chapter Toward a Human-Friendly Post-Singularity World in The End of the Beginning for a more detailed discussion of this sort of world; free PDF version here). Once AGIs are much more cognitively powerful than humans, then any human mindplexes that exist will, just like human minds, need to decide how far they want to fuse with these AGIs. Full-on fusion with AGIs will likely reduce the human component of any individual or mindplex to relative insignificance relative to the more powerful AGI component. Advanced AGI comes before advanced BCI. Then the only people who fuse into mindplexes, rather than fusing with AGIs, are ones who value humanity but not individuality. Advanced AGI and advanced BCI come about at around the same time. Then things really get complexicated! I was mildly distressed recently to find that our Ethiopian company iCog Labs -- recently written up nicely in Techonomy -- may not be the weirdest tech company in Addis Ababa. 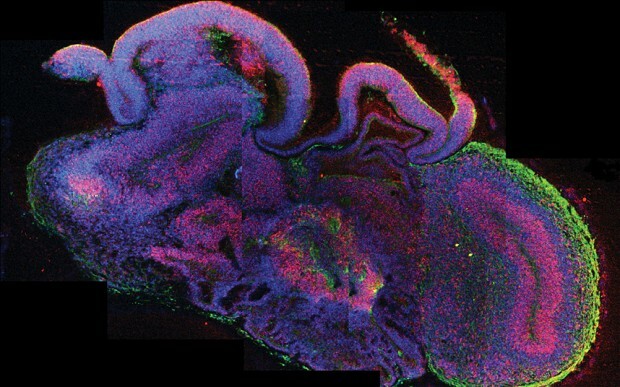 Probably many of you have seen recent news about biologists growing"mini-brains" in the lab.... This is really cool and would seem to open up all sorts of possibilities. Among them, obviously: GROWING PSYCHIC MINI-BRAINS !! Last year Damien Broderick and I co-authored a book summarizing some of the empirical evidence for "paranormal" phenomena such as ESP, precognition, psychokinesis and so forth. I won't re-tread that information about the evidence for psi here, you can look it up if you're curious! I gave some other links on the topic here as well. I bounced his idea off some psi-researcher friends and they were somewhat positive, but suspected it would work best if the mini-brain were attached to some sort of body. Pumping blood thru the mini-brain via an artificial heart would add some extra rhythmicity, which is important according to some views of the underpinnings of psi. Yyyeaahhh -- Now that's weird science, folks! Alas I don't currently have time to pursue this fascinating speculative direction, nor wealth to fund someone else to do it. But it's interesting to think about!